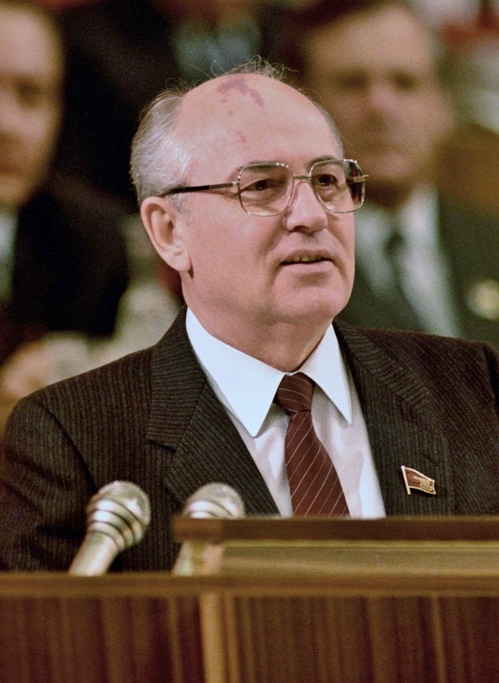 Mikhail Gorbachev was general secretary of the Soviet Union Communist Party from 1985–1991. He was also the first democratically elected President in 1990. Mikhail Gorbachev played a key role in dismantling the Communist grip on power in both the Soviet Union and Eastern Europe. His aspirations for democracy and reform opened up the way for the end of the Cold War and the bringing down of the Berlin Wall. He was removed from Presidential office in 1991, during a failed coup attempt. Since leaving office, Gorbachev has worked tirelessly promoting new efforts at social justice and concern for the environment through his own organization, the Green Cross. Gorbachev was born in March 1931 in Stavropol, the North Caucasus to a poor peasant family. At the age of 11, the district was occupied by the Germans for three years, a tough time for all in the village. In 1950 he enrolled at Moscow University where he became a member of the Soviet Union Communist party. It was here that Gorbachev met his future wife, Raisa Maxima, and they married soon after meeting. After gaining a degree in law, Gorbachev made much progress within the Communist party. In 1980 he was the youngest Politburo member and in 1985 he was elected General Secretary of the Communist Party. At first, Gorbachev was relatively unknown but he soon gave an indication that he wished to reform society. In particular, he announced two key policies, Perestroika and Glasnost. Perestroika involved reforming the economy and opening it up to market forces. Glasnost involved political reform. This involved freedom of religious expression and individual liberties; it paved the way for democracy and for many political prisoners to be released. It was particularly significant for the Eastern Block. When eastern European economies made calls for democracy, the Soviet Union no longer stood in their way (as they had previously in Hungary and Czechoslovakia). He has been credited with playing a major role in ending the Cold war, in both the East and also the West. In 1991 conservative military forces attempted a coup where the life of Gorbachev was in serious jeopardy. The Coup eventually failed but on returning to Moscow political power had shifted from the Politburo to modernizers such as Yeltsin. Gorbachev resigned and never made a successful return to Russian politics. Raisa Maximova, Gorbachev’s wife died of Leukaemia in 1999. They had one daughter, Irina. Although unpopular in Russia for his perceived role in the breakup of the Soviet Union, he remains an influential voice. Although he had previously supported Putin, In 2011 Gorbachev criticized his third term as Russian President. He was also critical of the democratic deficit in the 2011 elections. Gorbachev has also warned that in Russia. “politics is increasingly turning into imitation democracy” – with all the power in the executive branch. Gorbachev has also warned against a new ‘cold war’ and argued that America and the West need to be careful in interfering in Russian affairs and Russian spheres of influence. On issues of economics, he has called for a new perspective on economic issues – arguing the 2007 financial crash showed the limitations of the “Washington Consensus” – on free market economics. Gorbachev has also founded the Green Cross International – one of the principal sponsors of the Earth Charter – a movement to encourage greater concern for the planet and environment. Gorbachev has officially stated that he is an atheist. However, at the same time, he has been open to religious influences. He has admired the life of St Francis of Assisi, Pope John Paul II and cultivated a friendship with Indian spiritual teacher, Sri Chinmoy.